With the injuries piling up on their blue line, the Ottawa Senators looked into calling up defenceman Thomas Chabot. Senators general manager Pierre Dorion told TSN Radio 1200 Ottawa on Monday that when Cody Ceci was injured in Winnipeg, he had his staff look into recalling the 2015 first-round pick. However, Chabot and the Saint John SeaDogs are still in the QMJHL playoffs, league rules prevented the Senators from recalling the defenceman. Steve and Todd are joined by Ottawa Senators General Manager Pierre Dorion to talk about signing Colin White, process of the signing, the recall of Ben Harpur, injury updates and the final week of the regular season. "The exact rule is, we had eight defencemen on our roster at the trade deadline," Dorion said. "So, we would need four injuries to fall into an emergency status, in your second emergency status, then at that point in time, you can recall Thomas Chabot... When it comes to these things we always look at every possibility and everyone that's under contract that could come and help us. "In theory, when we look at it, one of our other guys would have to go down, then we'd have four healthy bodies and we'd be in second emergency, then we call up Thomas Chabot. I don't think the Saint John Sea Dogs would like it a lot." Dorion added Chabot is "arguably the best defenceman outside the NHL right now." Chabot was named the MVP of the world junior hockey championship in January after leading defencemen in scoring (four goals, six assists) and leading the tournament with an average ice time of 26:14 per game. He was also named best defenceman at the tournament. He posted 10 goals and 35 assists in 34 regular season games with the Sea Dogs and added three goals and 10 points in his team's first-round sweep of Rimouski in the playoffs. The Sea Dogs are awaiting their second-round opponent. 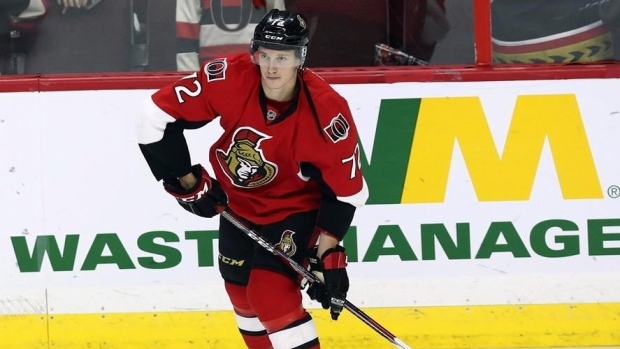 Chabot appeared in one game with the Senators this season before being sent back to the SeaDogs. He logged 7:09 of ice time with a minus-2 rating against the Arizona Coyotes. The Senators are dealing with injuries to Ceci, Erik Karlsson and Marc Methot along their blue line. Ben Harpur is currently with the Senators on emergency recall from the AHL.